Hoist up the sails and anchors aweigh, we’re off to find treasure in a land far away. 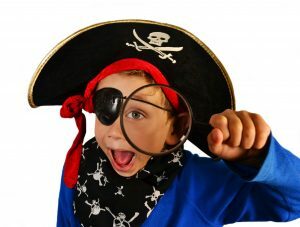 Let our Pirate for hire in Brisbane take your young buccaneers on a swashbuckling pirate themed party adventure to remember. Ahoy! If you’re looking for some good old fashioned entertainment, than our captivating magic show will certainly have all the kids in fits of hysterics. 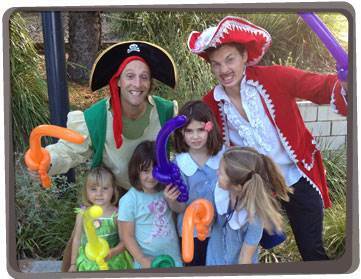 Our Captain of the Sea around Brisbane will also bring tons of great pirate party ideas for the birthday kids including: sculptured balloon art (everyone wants a balloon), pirate party games, a treasure hunt, pass the parcel, funny props, temporary tattoos and more. Face painting can even be done while the children are seated eating their pirate party food! So your birthday child knows they’re special, they’ll receive a special modelled balloon sea hat and balloon sword in the course of the magic show. 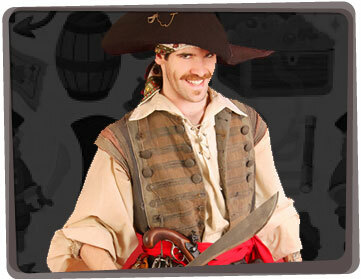 Our pirates for hire in Brisbane are experts in providing delight and awe. Some of the places we have entertained include hospitals, christenings, community and corporate events, fetes and markets, product launches, preschools, store openings, birthday parties and more. Book a 1.5 hr or 2 hr birthday party & receive a magic show! This pirate party game idea will keep the children busy whilst waiting for the enterainer to arrive! Give a handkerchief to each pirate. Have them insert it in their belt or back pocket. Leave it hanging. The pirates run after each other and try to take as many handkerchiefs as they can whilst protecting their own handkerchief from being taken away by other players. The pirate with the most handkerchiefs collected wins! Whether it is your child’s birthday or a special event, we can provide clowns, magicians, fairies, face painters, princesses, super heros and many other characters as well as rovers, family shows, stage shows, juggling workshops, drama classes, magic workshops and much more.